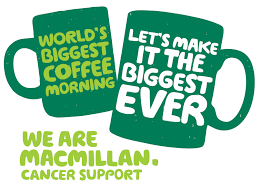 Just wanted to let everyone know we are hosting a coffee and cake morning in the clinic on Friday the 25.9.15 from 9-12, in aid of Macmillan and you are all invited! We will be serving loads of delicious cakes to treat your taste buds with and plenty of cups of tea/coffee to wash it all down with in return for a donation to this wonderful cause. Please can you help us make it a huge success by joining us on the day or feel free to drop off a donation beforehand. We will be accepting donations all week on behalf of Macmillan and if anyone fancies baking a cake for the morning, we would be very grateful. Please tell your friends and family they are also more than welcome to pop in for a cuppa! Looking forward to my piece of cake or two on the 25.9! See you there!